Though being a relatively plain area still Sandhole used to get disconnected from rest state during monsoon season which earn him dubious distinction of Kala Pani. This was state affair before and after independence. Though HRTC road hit the Sandhole in 70s but still after 40 year it is same story. 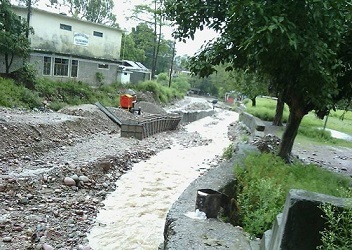 We have bridges on Bakkar khad and River Beas at Harispattan but still in most of area road in the khad itself. The picture camp bus stand taken in July 2015 exposes all the claims made by different government & political representatives. Do neta’s have to say anything on this? Now we should be ready to change in leadership. Its Time to develop revolutionary leadership itself from sandhol.